Use the V-Mount Battery Plate with 15mm Rod Mount for BMPCC 4K from IndiPRO Tools to power your Blackmagic Pocket Cinema Camera 4K with a longer-lasting V-mount battery. 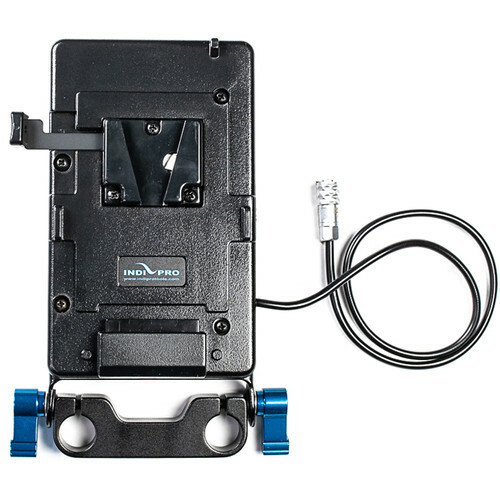 It connects to the camera using a dedicated 2-pin connector at the end of a 16" cable, and attaches to your camera rig via an integrated 15mm LWS rod bracket. If positioned on the back of your rig, the plate and battery can function as a counterweight. This plate features one D-Tap output for powering a 12 to 16V accessory simultaneously with the camera. Box Dimensions (LxWxH) 10.7 x 5.4 x 2.35"
V-Mount Battery Plate with 15mm Rod Mount for BMPCC 4K (16") is rated 1.0 out of 5 by 1. Rated 1 out of 5 by Dan from BURNT OUT CAMERA! DO NOT BUY THIS! BROKE MY BMPCC4K Buyer beware. Although I trust the items that B&H usually carries... this item is not made correctly. The second i plugged my camera into the v-mount plate it burnt out the camera. It smelled like smoke right away. I immediately unplugged the camera but it was too late. The camera is complete ruined now. Although i hope B&H owns up to this mistake of carrying this product before actually trying it in store, I do now want ANYONE else to have to burn out their camera like happened to me.